Does Aum Atichart do best in revengey lakorns? I think so. If you remember Jam Loey Rak, Aum plays the angry Harit who mistakenly kidnaps Soraya so he could punish her for what he felt was her part in killing his beloved brother. 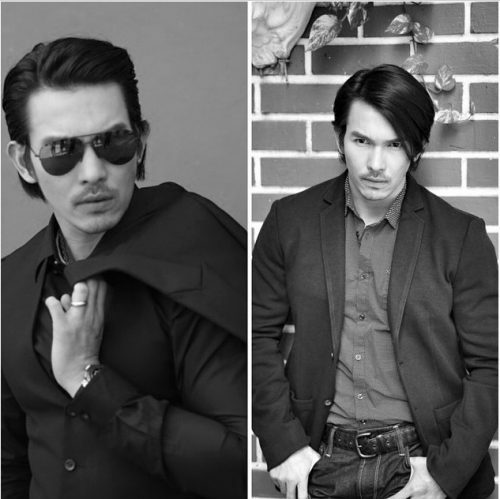 That lakorn was incredibly popular because Show managed to justify Harit’s actions and turn him into a loveable pr’ek despite his tough façade, especially when he found out he kidnapped the WRONG girl. Oops. 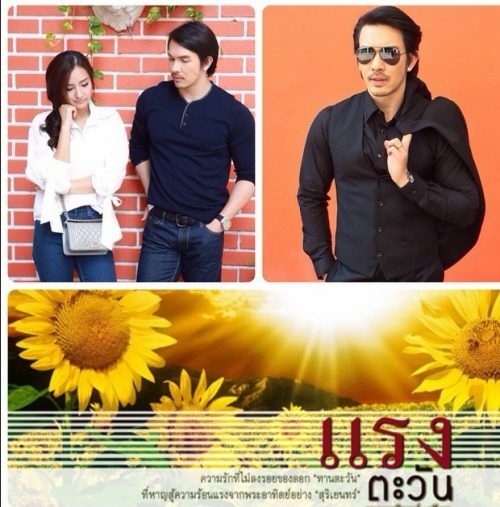 Rang Tawan (The Burning Sun) will air after “When a Man Loves a Woman,” taking over the Wednesday-Thursday timeslot. Aum Atichart plays Suriyen (aka Nai Pu) who is determined to bring justice to his older sister’s death. Chippy Sirin plays Tarntawan (Sunflower or aka Kate) who returns from graduating abroad, discarding her dream of becoming a designer, in order to deal with her older brother’s mess, who is being accused of murder. To make matters worse, Suriyen feels that Tarntawan along with her family, all conspire in this murder. As you can imagine, Suriyen is going to get all revengey while Tarntawan will try to prove to him that she’s innocent of any wrongdoing and maybe her brother is too. Second leads are played by Peach Pachara and Aom Sushar, and they’re really cute together. Perhaps it is nice to have a couple with less drama since there will be plenty of angst and anger coming from our main leads, Aum and Chippy. But if anyone were to do a revengey drama right, it’s Aum Atichart. King of Revenge. Question is, can Suriyen bring the fan fervor as Harit? Only one way to find out. Goodness! Can I say I still never forgave Harit? He got off easy! But I too call him the King! Looking forward to this! Re: JLR. It’s such a taboo lakorn right? It’s sad that it’s kinda the norm back in the day, but I’m glad lakorns in general now are changing (albeit slowly). This kinda goes along with even romance novels that were written back then. I won’t get too much into it because that’s another topic altogether, but people have to realize that you wouldn’t fall in love with a man who treated you badly, even if he got on his knees and beg for forgiveness. IF they decide to remake this one down the road, it’ll need some serious scrubbing. I’m all for new scripts. I love Aum. I like in in Maya Tawan too although the pairing with Yaya didn’t work so well in my opinion. Can’t wait. Most of the Aum lakorns I like are much older. I don’t know if that says anything about his lakorn choices in the last few years. But I hope this is a good one! Do you know anything about Ch.7 lakorn? Like, whats coming up next? call me a chicken but I’m scared of spooky lakorn and also, not my kind og p’nang. Right, on that. Aum does revenge very, very, very well. And scrumptious too. Can’t wait to watch this! I’m not familiar with download sites but you can watch it on Thaitv3’s YouTube channel..
Is there any hope for this to be subbed. Please if you know anything can you tell me. This one is being subbed at: https://www.youtube.com/watch?v=OLJsGwIuWSg. Enjoy!